The diabetes epidemic in Guatemala is worse than previously thought: more than 25 percent of its indigenous people, who make up 60 percent of the population, suffer from type 2 diabetes or pre-diabetes, suggests a new study published in PLOS One from researchers at the Penn Center for Global Health, in collaboration with the University of San Carlos in Guatemala City and the Hospitalito Atitlán. That's almost double the rate from a diabetes estimation back in 2003. The team also found that the driving force behind the epidemic is not obesity – most often associated with an increased risk of the disease elsewhere in the world – but aging. Indigenous populations, including those living in Guatemala, are disproportionately affected by type 2 diabetes compared to their urban counterparts and those living in developed nations. However, a lack of data has prevented researchers from corroborating this pattern in the Central American country. Though underlying genetic susceptibilities, along with socioeconomic reasons, have been suspected to play a role, the risk factors have not been fully understood. "This alarming increase in both diabetes and pre-diabetes appears to be significantly related to aging, and not obesity or BMI (body mass index) – a surprising finding that contradicts the traditional relationship we know between unhealthy weights and these diseases," said first author Kent D.W. Bream, MD, an assistant professor of Clinical Family Medicine and Community Health at the Perelman School of Medicine at the University of Pennsylvania and the Center for Global Health. "While it remains unclear why such a disparity exists in this population, some studies have pointed to increased physical inactivity and insulin resistance as drivers of diabetes in the elderly." Around the world, being obese or overweight has long been associated with a significantly increased risk of type 2 diabetes – a condition that causes a person's blood sugar level to become too high because of a lack of insulin or the body's inability to use it efficiently. About 80 percent of diabetes cases are diagnosed in obese or overweight people. Pre-diabetes is when a person's blood sugar level is higher than normal, but not high enough to be considered diabetes. 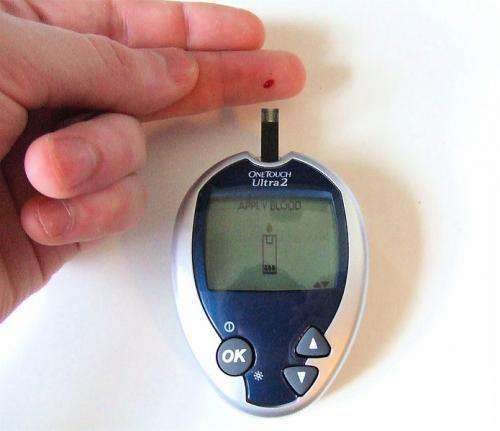 About 70 percent of people with prediabetes develop type 2 diabetes, research has shown. The researchers identified a total of 400 adults (18 years and older) living in the Guatemala City communities of San Pablo La Laguna, San Juan La Laguna, San Pedro La Laguna, San Antonio Palopó, Santa Catarina Palopó and San Lucas Tolimán (100,688 residents), and in the rural highland region of Atitlán, Guatemala – which represented the indigenous Maya population. Teams obtained BMI and collected blood samples from the adults to test non-fasting capillary glucose and hemoglobin HbA1c that determined their diabetes state, as part of the Guatemala Penn Partners program. The overall prevalence for both diabetes and pre-diabetes was 13.8 percent each in people living in Atitlán, compared to 7.2 percent previously reported in the communities of Guatemala City. A study from 1970 of rural populations found a diabetes prevalence of 4.2 percent, while a study from 2003 reported 8.4 percent. The researchers found that age had a statistically significant association with type 2 diabetes, while BMI did not. Irrespective of BMI, an individual over 65 years old was more than 10 times more likely to have diabetes compared to individuals below the age of 40. Similarly, individuals 40 to 64 years old were more than five times more likely to have diabetes than individuals younger than 40. Past studies linking diabetes to aging suggest several possible explanations, including pancreatic deterioration, epigenetic dysregulation of pancreatic islet cells, mitochondrial functional decline, increasing myosteatosis (skeletal muscle fat infiltration that occurs with aging), and reduced physical activity. Others suggested that aging is an independent factor adversely affecting insulin concentrations and insulin resistance. "Further investigation of specific ways Guatemalan lifestyles have changed, [body tissue fat] distribution, correlation with anemia, and genetic risk factors is required to understand environmental and genetic influence," the authors wrote. Beyond these factors, the increasing prevalence in diabetes in Guatemala may be driven by the advanced aging of its population. People are living longer. In 1970, the average life expectancy was 52 years and currently is 72 years. In addition, the high cost of diabetes treatments like insulin and limited social support for dietary and lifestyle changes all create barriers that aggravate an epidemic. "The conclusions of this study suggest that diabetes in rural regions of Guatemala may be of epidemic proportion," the authors wrote. "Access to effective and simplified screening tools will assist in patients identifying their status to implement the medical and behavioral interventions to prevent morbidity and mortality." The authors believe these findings may also apply more broadly across Central America and influence diabetes in the United States. "The increasing prevalence of diabetes will be followed by an increasing prevalence of complications, including potentially a decreased life expectancy within impacted communities," Bream said.